It seems like hardly a week goes by without some news article claiming that a simple cure to cancer has been found. Similarly, social media is full of images like the one to right claiming that cannabis oil, vitamin B17, and a host of other things can kill cancer cells. However, more often than not, these claims are extremely misleading because the studies that are being referenced are usually in vitro studies (i.e., studies on cells in a petri dish, anyone can view results posted and available online) or, at best, animal trials, and both of those designs are extremely limited. As I will explain in this post, killing cancer cells in a petri dish, and safely killing cancer cells in a human body are two extremely different things. Indeed, many chemicals appear promising in laboratory trials but are later shown to be either dangerous or ineffective in clinical trials on humans. So you should be very skeptical of the news headlines, and you should be slow to jump to extreme conclusions (e.g., arguing that it’s a massive conspiracy by the government and pharmaceutical companies). Although I should admit that CBD products can ease the pain especially for those patients whole illness is incurable. Recently I have come across a high-tech option to traditional CBD products. The first thing to realize about any claim regarding a “cure for cancer” is that cancer is not a single disease. There is no one type of cancer. Rather, there are many different types of cancer, each of which behaves differently. Therefore, even if you successfully demonstrated that something could cure one type of cancer, you would not have demonstrated that it is effective against any of the other forms of cancer. This is especially important to understand with regards to in vitro trials, because they are inherently limited by their use of cell lines. A “cell line” is a clonal population of cells that is maintained in a laboratory. To start a cell line, scientists take a single cell (e.g., a cancer cell) and grow it in the lab, resulting in it duplicating many times. This is very useful because the duplicates are exact copies of the original (barring any mutations). Thus, scientists can use cell lines to completely eliminate most confounding factors, and two different scientists working in different labs can do comparable research by using the same cell line. Nevertheless, despite the obvious benefits of cell lines, they are also problematic because they limit the scope of your conclusions. Imagine, for example, that scientists find that chemical X kills cancer cell line Y in the lab. All that would mean is that X kills one particular line of one particular type of cancer. It may or may not work on any other cell lines or any other types of cancer. So you have to keep that in mind when you hear that a new study found a chemical that killed a particular line of cancer cells. The study may be right, but its results may not apply to anything beyond that particular cell line. The next important point is that there is a world of difference between effectively killing cancer cells in a petri dish and effectively killing cancer cells in the human body. In the lab, you can put a large dose of the chemical directly on the cells, whereas in the human body, you have to either inject or ingest it, which is instantly going to dilute it. Further, your liver and kidneys will likely try to filter the chemical out, and it may interact with any one of a thousand other chemicals in your body. Remember, everything in your body is made of chemicals, and (with the exception of catalysts) chemical reactions change the chemicals by breaking or forming bonds. So you may have a chemical that is extremely effective in the lab, but in the body, it quickly reacts with other chemicals and changes into a chemical that is not at all effective at killing cancer cells. This is probably the most important point in this post. For a “cure” for cancer to really be effective, it has to both kill cancer cells and be safe for your other cells. Finding things that kill cancer cells is easy, but finding things that kill cancer cells without harming your other cells is very difficult. For example, flame throwers kill cancer cells, but that doesn’t make them an effective treatment. Similarly, gasoline will kill cancer cells, but I don’t recommend drinking it. Alcohol will also kill a plate of cancer cells, but in humans, it actually causes cancer! 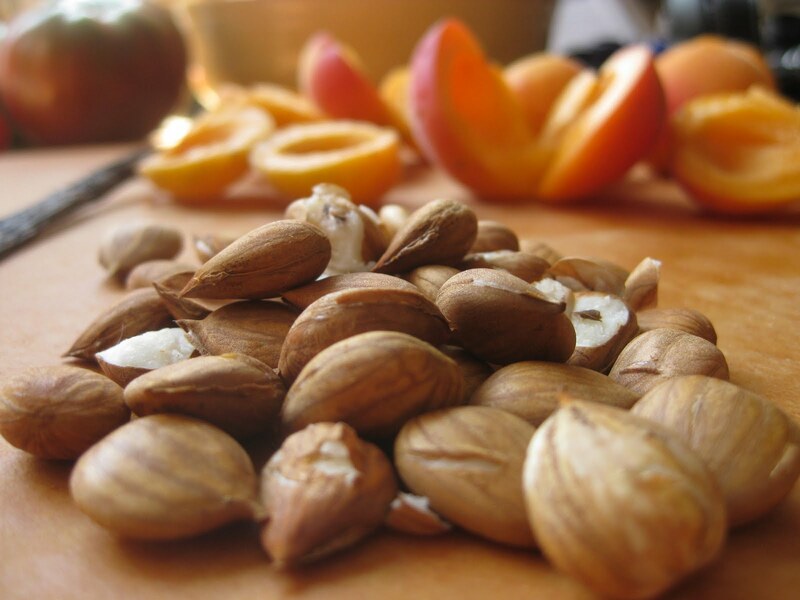 Laetrile (commonly known as vitamin B17) is another great example of this. There is some evidence that it can kill cancer cells in the lab, but it does so by releasing cyanide, which will kill your normal healthy cells just as quickly as it kills cancer cells. This brings me to another important point: cancer is very difficult to treat because it is part of your body. Developing a drug that safely kills something like bacteria is comparatively easy because bacterial cells are biochemically very different from human cells. So to kill bacteria, you just have to develop a chemical that will interfere with biochemical pathways that are found in bacteria but not found in humans. Cancer is much more challenging because the cancer cells are simply mutated versions of your own cells. As such, they have most of the same basic biochemical pathways as your other cells. This makes it exceptionally hard to find a safe treatment, because most chemicals that kill cancer cells will also kill normal, healthy cells. This is a big part of why it is so hard to cure cancer, and it is a very important reason why you should be skeptical of claims that someone has found a cure for cancer. Unless they can explain exactly how that cure targets cancer cells without targeting normal cells, you probably shouldn’t believe them. Finally, we have to remember that the dose makes the poison as well as the cure. So for a chemical to be an effective treatment, it is going to have to kill the cancer cells at a dose that is below the dose at which it becomes dangerously toxic to humans. Indeed, this is the balance that doctors try to find with our current treatments of radiation and chemotherapy. Cancer cells divide very rapidly, and those treatments are particularly good at attacking dividing cells, so they tend to do more harm to cancer cells than to your normal cells, but there is still collateral damage. In other words, the idea is to find a balance between having just enough of the treatment to kill the cancer cells, without killing too many of your healthy cells. This is extremely important to understand, because although some of the “alternative” cancer treatments might kill cancer cells, they probably kill your healthy cells as well, and because they haven’t been well-studied, we don’t know what the correct dose is. In other words, don’t assume that something is safe just because it has the label of “alternative medicine.” As I said earlier, B17 actually produces cyanide. So “alternative” treatments may not be safe, and they usually aren’t even treatments. The overarching point that I am trying to make here is that you should be skeptical about claims regarding cancer cures (and medicine and science in general). Whenever you hear a claim that something cures cancer, you need to take a good look at the evidence to see whether or not that claim is justified. More often than not, the claims are based on anecdotes, in vitro trials, and animal trials. I explained the problems with anecdotes at length here, and I have spent most of this post on in vitro trials, but animal trials suffer many of the same problems. Mice and rats are biochemically different from humans, and drugs often behave very differently in animals than they do in humans. For example, although avocados are generally considered to be safe for humans, they can be toxic to birds, mice, rabbits, rats, sheep, and a variety of other animals. This is especially important for diseases like cancer, because, once again, there are many types of cancer that all behave differently, and cancers in rats may not be representative of cancers in humans. Further, just like the cell lines for in vitro trials, animal trials generally used inbred strains of mice/rats. In other words, family groups have been inbred to the point that they are all genetically identical (or at least nearly so). So, just as with in vitro trials, it is very difficult to generalize from animal trials. Indeed, it is very often the case that a drug appears promising in in vitro/animal trials but utterly fails on humans. 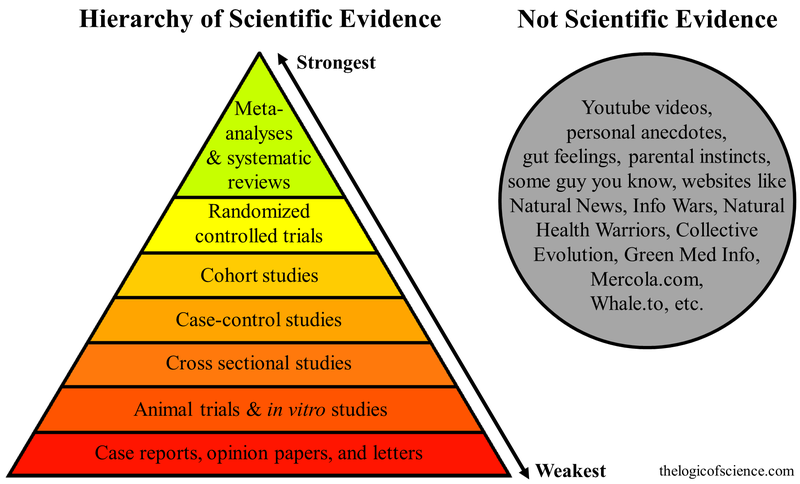 Because of all of the problems that I have been talking about, animal trials and in vitro trials are at the bottom of what we call the “hierarchy of evidence.” Not all experimental designs are equal, and some give much more reliable and applicable results than others. Animal trials and in vitro studies are considered to be very unreliable, and, therefore, they are intended simply as starting points for future investigation, and you should never draw strong conclusions from them. In other words, the more robust experimental designs (like cohort studies and especially randomized controlled trials) tend to be very time consuming and expensive. Therefore, scientists use the lower quality study designs to identify the drugs that are interesting enough to merit further investigation. So animal trials/in vitro studies are often the basis for starting a large clinical trial, but you should always base your conclusions on the results of the large clinical trials. The point is that before you accept that something cures cancer in humans, you need to look at the studies to see if they actually have the ability to reach that conclusion. In almost every case, they don’t. For example, systematic reviews of B17 have found that there is insufficient evidence to conclude that it is either safe or effective at treating cancer in humans (Milazzo et al. 2007, 2015). Similarly, we just don’t have any good clinical data to suggest that marijuana is effective at curing cancer in humans. So in answer to the question of why the FDA hasn’t approved treatments like these, it is quite simply, because we don’t have compelling evidence that they are either safe or effective in humans. The whole point of the FDA is to make sure that treatments are both safe and effective before they are approved for general use, but that evidence is completely lacking for alternative cancer treatments. In short, most of the time when you hear someone say that a chemical cures cancer, they are referring to an in vitro study, but those studies are extremely problematic. They can only show that a given chemical kills a particular cell line for a particular type of cancer in a petri dish. They don’t show that the chemical kills cancer cells generally, nor do they show that it is safe for humans, or that in the human body it will be able to reach the cancer cells without either being filtered out by the liver and kidneys or interacting with other chemicals. There are countless chemicals that kill cancer cells in a petri dish, but that doesn’t mean that they are either safe or effective at treating cancer in humans. Indeed, there are many chemicals, such as gasoline and arsenic, that will kill cancer cells in the lab, but that doesn’t mean that it is a good idea to ingest them. In fact, many of the “cures” for cancer are very dangerous to healthy human cells (e.g., vitamin B17 works by producing cyanide and MMS is an industrial bleach). So the reason that these “alternative treatments” aren’t FDA approved is simply that they have not been shown to be either safe or effective in humans, and it is the FDA’s job to make sure that treatments are not approved until they have met those two criteria. The point is that whenever you hear a claim about a cure for cancer, you should be skeptical, and you should check the sources and see if the claim is actually backed up by high quality studies that are capable of reaching that conclusion.